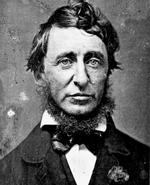 Today, July 12, is the birthday of Henry David Thoreau, American writer and philosopher. He was born in Concord Massachusetts in 1817 and died in his natal town in 1862 from tuberculosis. One of his most famous books is Walden.